I have selected 4 pedals which underscore these trends - three of my favourites from last year, and the forthcoming significantly enhanced and improved Red Panda Particle V2. These pedals individually and in concert demonstrate some of the finer points I’m trying to get across. The forthcoming Red Panda Particle is significantly compacted over its predecessor, and now comes with 4 presets onboard and dual footswitches. I’m not sure if the single LED is a multi-colour one, as the previous pedal had two separate LEDs, and it would make sense for some kind of visual signifier to trigger when you hit each footswitch - we’ll wait and see. As will become clear in my forthcoming JHS pedals overview, I actually only have two of Josh Scott’s pedals to date - his Bonsai multi-Tube-Screamer overdrive from last year and his sort of equivalent effort for Big Muffs - the Muffuletta from a couple of years earlier (I have by contrast several of JHS’s modded pedals - EHX etc.). For fans of a certain genre it’s kind of a no-brainer to acquire a sort of ’greatest hits’ pedal of all the main flavours - the Crazy Tube Circuits Constellation sort of does a similar thing for Tone Benders. In any case I expect to see more of these sorts of pedals in future years. I am very much enamoured by the fairly recent arrival of my Jackson Audio Bloom, which suffered some significant production delays, but has kind of overcome all of that with its incredible versatility. It combines 3 different functions in one pedal - a Compressor, EQ and Blooming Boost - which are controlled by the individual and both footswitches together. The Compressor part features 6 presets which you can cycle around with the left footswitch - and the left-hand ’Comp’ LED changes colour to reflect your selection - white, green, magenta, blue, aqua, orange - and moreover the light morphs when in action to reflect degree of compression - very clever. The final pedal reference is one that I was initially not sure I would need/want, but one that I’ve decided I will definitely be getting this year - fort its ability to morph your single guitar output into a range of different reference guitar tones. This degree of added utility is something I believe we will see more of in the very near future, and Keyztone will be refining its offering while preparing to fend off others trying to do the same thing. We have already seen this courtesy of Alexander Pedals Neo Series, last year's Jackson Audio Bloom, and this year's forthcoming V2 Red Panda Particle - pedals are becoming increasingly smarter. I've always been drawn to the likes of Chase Bliss Audio for how much functionality and versatility they manage to squeeze into a compact enclosure - but there is always room for improvement. Joel's most recent pedal - the Dark World Reverb has quite a revolutionary concept at its heart - where it sort of 'mashes' up the classic and the otherworldly and really gives you the best of both worlds - and a huge scope for experimentation and unique tone-sculpting. We've seen an increasing amount of dual simultaneous effects pedals - like the Empress EchoSystem, Boss RV-500 and Source Audio Ventris - and we will see a lot more of these from pretty much every type of maker. I feel that we will witness an explosion of more experimental sounds - along the lines of the Dark World - where pedals provide you with both the every-day and the extraordinary and allow you to mix those up in a number of different ways. This really has two angles - the kind of Bonsai Tube Screamer and Muffuletta Big Muff Compilation methodology as engineered by JHS Pedals, as well as a broader gamut of voicing options and possibilities on the more basic of drive pedals. You will rarely find me buying just a straight up 3-dial Level + Gain + Tone pedal - unless those 3 dials are extraordinarily powerful in range and impact - which is rare. I much prefer a pedal with some clipping and voicing options which not only lets me more easily and successfully dial things in to suit my setup, but give me more tonal options - more voices of playback - for more usability and utility. The two 'greatest hits' JHS pedals are great examples of this genre, but I would have liked still further options where I could evolve and sculpt the tone of those voicings bound the classic defaults - i.e. give me 3-band active EQ and give me a boost switch - either toggle or additional footswitch to help me extend the range of said overdrive, fuzz or distortion! I have had various dialogues with pedal-makers over the years about why they are missing 'state' indicators for certain types of footswitches like up/down toggles and extra footswitches - a number of pedals have additional clipping and switching options, but they are not always reflected visibly on the pedal as the real-estate is tight and there is not space for more than one LED. The solution therefore is to have a 'Multi-Colour' LED - which simply changes colour to reflect different states. Certain types of these LEDs can have 6 or 10 visibly different hues to indicate different states and voicing of pedals - so instead of fitting in several different LEDs you can maximise the visual and visible versatility of just a single unit. The Compressor LED on the Jackson Audio Bloom shifts through 6 different hues to indicate which mode or preset you have selected - and the Red Panda Particle V2 could have taken that approach with its own Preset display - there are of course pros and cons of each approach, but where real-estate is limited - it makes ultimate and optimal sense to deploy a single Multi-Colour LED. I have already come across a few of these, and this will become much more prevalent very soon. Much like 'More Voicings' this actually means two things - getting more Utility out of your single Guitar or single Rig / Pedalboard, as well as getting more utility out of a single pedal. In case of the former the Keyztone ExChanger is a great utility for both Single Coil and Humbucker guitars - giving you pretty distinctly the flavour of the other and enabling a much greater degree of versatility without having to keep on swapping guitars around. The case for the latter is both the Jackson Audio pedals, the newer Bloom in particular - also the new Unit67 From DryBell and ThorpyFX's Team Medic and Chase Bliss Audio's Condor - these are all examples of 'More Utility' pedals - singular pedals which do several complimentary functions fantastically well. As players want more diverse effects within their pedalboards - like my and my 40-slot pedal-chain there does become a maximum upper limit, which means the diligent use of 'More Utility' pedals to give you the most versatility and variety of what is available. This is also quite distinctly within the more individualised pedal landscape - as there is of course the parallel revolution in digital multi-effects units - but I like to mix up both Analog and Digital Varieties - with the sort of Chase Bliss 'Analog Heart, Digital Mind' my preferred approach - with more smarter management of analogue signal processing courtesy of a 'digital management and switching layer'. This means you can have an analogue pedal with presets and multiple-settings possibly from common tone-controls across several voicings. A very large number of my favourite pedals in recent years have been of this sort of variety and I feel we will see much more of some very clever Analogue+Digital hybrids over the next few years. I see it as a main means for the boutique builders to compete with the convenience of Axe-FX, HeadRush, Helix and Kemper. There are several pedal-makers raising the standard for what is achievable - Alexander Pedals, Chase Bliss Audio, Cooper FX, Empress Effects, Jackson Audio, and Red Panda to name just a few - in fact even JHS uses some digital control-layer switching trickery in its analogue Bonsai pedal - these methods are all being adopted across the board. I think even with simpler 3-pot pedals you can do smarter things with an additional digital layer. For instance one of the things I miss on my EchoSystem is an LED screen for Milliseconds or BPM - it's so useful for delays to know what the time interval is, and what sub-division is being applied - I frequently inadvertently knock the Sub-divisions dial, and am perplexed when the tap-tempo does not seem to respond as I expect it to. I really like the fact on the TimeLine that I could see visual signifiers of 'tempo' and sub-division, it's one of the key advantages of the Free The Tone Flight Time Delay Pedal. I still feel we are in the infancy of analogue+digital hybrids in terms of the full potential of such a combination. I have several ideas for how both the core Empress Effects and Chase Bliss Audio pedals could be improved. 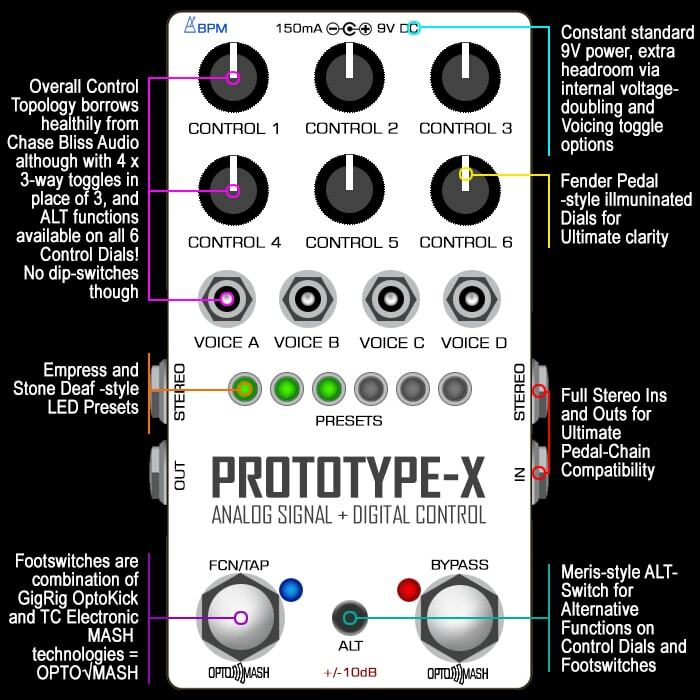 I know I'm somewhat in a minority as a stereo rig deployer, but I would love to see more viable compact offerings in that sector - there is a whole slew of really smart compact pedals which are mono only. The same goes for the burgeoning 'Glitch' sector - which currently has some exceptionally smart and wonderfully sounding pedals, but they don't cater to the stereo dimension at all - and mainstream builders have yet to properly latch onto the joys of 'Glitch' - in fact that is another area I see enormous growth in over the next few years - there are so many different dimensions to glitch. Even the most subtle of analogue artefacts - what makes a tube signal warmer, more organic and 3-dimensional is largely down to organic random glitches - which is an area that could be better manipulated for improvement to solid state playback. In fact most things are so overtly digital and over-processed these days that recording studios are increasingly looking for ways to put more 'noise' and ambience back into the signal. So 'Glitch' does not have to mean jarring and challenging stuttery or twittery sounds, but just organic artefacts which produce more ambience and soundstage and feel - and inject some more raw emotion back into the mix!